The view from our bedroom window keeps changing. This morning the same bedroom window that offered us a glorious view over the Araucania covered mountains across the lake when we arrived, snow covered Christmas scenes yesterday morning and back to normal when we returned in the afternoon, this morning gave us ….. pea soup! But very spectacular as over breakfast (with camera in hand) we watched it clear up. Should have used my tripod to do some time-lapse shots. We’re not complaining! Our guide, Martin, is a teacher at the secondary school in Lonco Luan and had to be at work until 15:00 hrs. So we spent the early part of the day on the road to Zapala. In 2010, Guillermo Rivera’s party were travelling 2 days ahead of us and reported to have passed a spot along the Zapala road, where some 200 Tephrocacti had been in flower – 56 km from where we were. Now I wasn’t so silly to expect that they’d still be in flower, but certainly hoped that a drive to the area might suggest the spot and that one or two of the plants might reveal themselves. They did not, but we have some more shots of the spectacular scenery. We’ll drive through here again tomorrow as we move north. Martin was ready and waiting as we arrived at the school. What did we want to see? Cacti or Viola? Again, both was the reply. We had been warned that it was probably too early in the season for the Viola and also, with Pterocactus not in flower yet, these would be difficult to spot. So, cactus first – a location away from Villa Pehuenia and one that we had visited also in 2010 – at the base of a huge rock on private land.After the long break since last seeing cacti in habitat, I practically raced up the hillside to where I knew the plants were. They looked in excellent shape but again – too early for flowers. Angie found her first Austrocactus ever, a bit lower down on the hillside – one that I must have gone straight past on the way to my patch. We photographed about a dozen groups of plants but then it was time to move on again. By now it was 17:00 hrs and Martin estimated arrival at the Viola spot around 18:30. 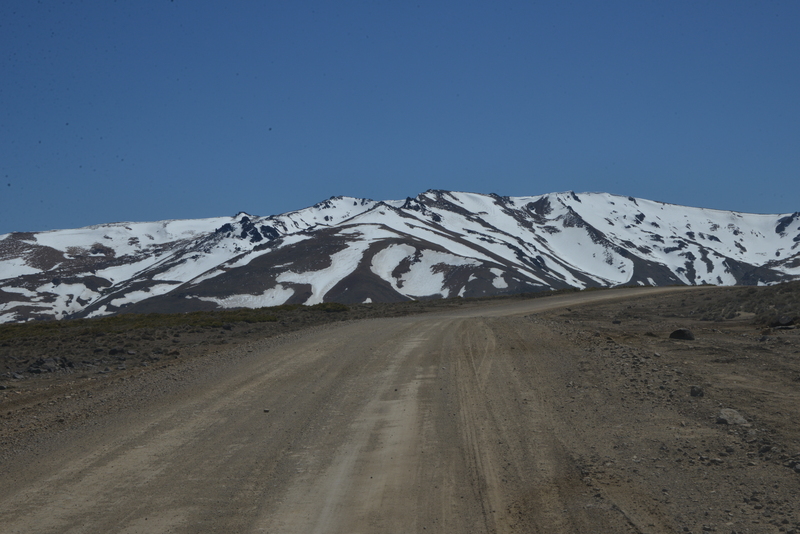 I was amazed to learn that the track that we were on now – and had been in 2010 – was in fact the road to Paso Il Arco, another border crossing with Chile. Quite hairy! Particularly as the tyres provided little grip. Again, a snow field blocked our way and again we had to cross it on foot. Martin walked ahead as we changed foot wear for a short hike. At the place where he had expected to find some plants there were none. On to another spot, but again no joy. The problem was that the snow & ice was lower this time so we were still short of the 2,000 m mark that Viola seem to prefer here. We explained that the Viola at Laguna Laja in Chile had been up and flowering, but that was a day’s drive farther north (i.e. closer to the Equator) and on black rock that acts as a heat sink. Also worth reporting that the Patagonian wind that had plagued us during 2010 had only appeared once or twice. This morning’s drive had taken us past the spot where in 2010 I had already returned to the car when Juan was caught in a mini hurricane that battered him with sand and pumice particles. John and Cliff had been observing the event from the hillside, above the turmoil. Today it had been very calm, a great photo opportunity. It was dark when we arrived at Villa Pehuenia, around 20:30 and said good bye to Martin. He did not want to accept any money for his time – as Alejandro had already suggested yesterday – just a warm handshake of friendship. This we did plus I gave him a very rare book indeed! The only copy in existence of the Cactus Trip Diaries – Patagonia 2010! I can always print off another copy when I get back to the UK. He was over the moon!